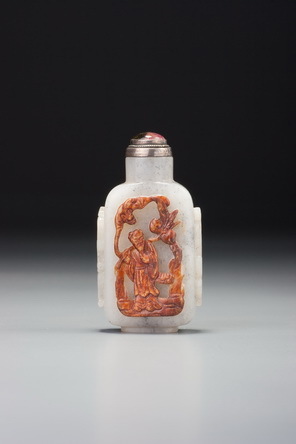 Several features identify this bottle as a product of the Beijing palace workshops. 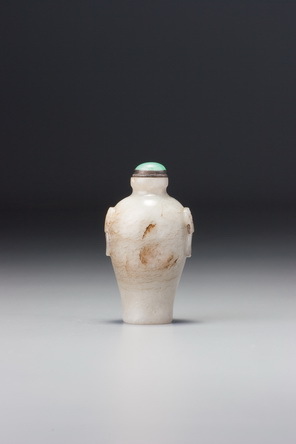 It is of modified meiping (‘prunus-blossom vase’) form, has a flat lip on the upper neck rim, is of inherently undistinguished material (reflecting the Qianlong emperor’s love of archaism and pebble nephrite that resembled that used by the ancients), and is decorated with small, distinctive mask handles with circular rings. The meiping form had been used in ceramic production from very early times, and the imperial collection of the Qianlong era must have been well-stocked with examples from all of the different periods and from the contemporary output of imperial workshops and kilns around the empire. A comprehensive catalogue of the imperial collection of bronzes compiled under the editorship of the official Liang Shizheng (see Hummel 1943, p. 503) was commissioned in 1749 and completed in 1751. Two major supplements were published in 1793, and together these volumes provide a comprehensive survey of mask-and-ring handles. This may account for the fact that these handles on products of the palace workshops exhibit a considerable variety of style. The routine reproduction of mask handles as peripheral decoration in commercial workshops located elsewhere in the empire would not have prevailed at the palace workshops to anything like the same extent. Indeed, there is a sense that in many cases the mask handles were a feature that was considered an independent art form rather than a standard detail, and this is apparent in the finished product. With a bottle of this type, where the mask-and-ring handles are the only carved decoration, this feature is often accentuated, and that is one reason why it is not possible to define court mask handles as being of a specific style. Some have ears, some do not; they vary in size, details, style, and shape of ring, and even sometimes omit the ring. Apart from this individuality of style, certain features can be said to be common, such as a preference for small size and small circular rings, both of which are found here. The beast here has distinct ears, rather than the formalized, curling hair that often replaces, or rather hides, the ears in one alternative and common form for masks. They are not, however, the long, drooping, distinctive ears of the type found on products of the Master of the Rocks school of jade carving. This bottle has the standard, imposing sculptural qualities of so much of palace production regardless of the material used. Formal integrity is excellent, and the gentle curves of the main body and detailing of neck, foot, and carving are impeccable. If one imagines the rings to be loose, and the vessel to be of a size where it could be picked up by these handles (originally their purpose, of course), the balance of the form with the handles supporting the weight of the body is remarkably satisfying.